Sociologist Laura Stark is a careful observer of the IRB system, having based her dissertation on archival research and direct observations of three university IRBs. In 2008, I complained that the dissertation, "Morality in Science," reported but failed to condemn bad IRB behavior. In a newly published essay, Stark takes a more critical stance. In her essay, Stark traces today's IRB system back to systems established in the 1960s at the NIH Clinical Center, which performed experiments on "hundreds of healthy prisoners, conscientious objectors, unemployed people and students living in their hospital as subjects." She finds that system included two basic flaws: it failed to inform the public about what was going, and it gave no voice to dissenting members of ethics boards. These flaws, she argues, remain in today's system of ethics review. 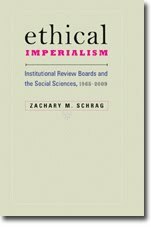 Replace the thousands of local review boards that labor independently at universities and hospitals here and abroad with a small number of ethics-review networks organized around specific research methods rather than around institutions. The networks would be better equipped to handle multi-site studies that are now commonplace, and would remove the political biases of some outlier institutions. Consider the advantages and disadvantages of outsourcing ethics review to private companies, which review research for a fee. Finally, empower research participants by posting the results of ethics reviews online. The current system includes community representatives who presumably speak on behalf of research participants, but that's not good enough. Though the essay does not specifically mention IRB review of research in the social sciences and humanities, the dissertation gives examples in which the lack of transparency and lack of expertise impeded such projects. Thus, Stark's call for expert boards and published results of ethics review could address non-biomedical research as well as the medical research that is her chief concern. And while Stark presents her proposals as ways to ensure better protection for research participants, they could also benefit those researchers who now fall victim to inexpert boards. Because the current system fails both researchers and participants, reform can benefit them both. Stark should realize that the changes she proposes would require more than "rebuild[ing] the regulations from the ground up," since the requirement for local IRBs is encoded in federal statute, not just regulations. But a wholesale reconsideration of the IRB system by the presidential commission would be a fine first step.